The topic of our presentation is: What can competitive intelligence professionals learn from the CIA’s intelligence failures? More on our session here. 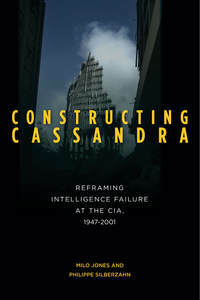 About the book: Constructing Cassandra conducts an inquiry into the intelligence failures at the CIA that resulted in four key strategic surprises experienced by the US: the Cuban Missile Crisis in 1962, the Iranian revolution of 1978, the collapse of the USSR in 1991, and the 9/11 terrorist attacks. While some of these events may seem distant, these surprises still play out today in US policy. Although there has been no shortage of studies exploring how intelligence failures can happen, none of the prevailing explanations has been able to provide a unified understanding of the phenomenon. Without that understanding, failures will happen again—with dramatic consequences. The book brings culture and identity to the foreground to present a model of strategic surprise that focuses on the internal make-up the CIA. It also takes seriously those Cassandras who offered warnings, but were ignored. By providing this novel, unified model of strategic surprise—that links terrorist attacks to more conventional failures—this book offers the first deep and systematic exploration of the ultimate sources of the CIA’s intelligence failures, and points to ways to prevent future strategic surprises. For more information about the book, visit Stanford University Press’ site. This entry was posted in Our work featured and tagged CIA, competitive intelligence, Constructing cassandra, Intelligence failure, SCIP, strategic surprise. Bookmark the permalink.